The original 8-bit Nintendo is hard to give up -- for my generation -- it is the classic video game system, just as Oregon Trail is our defining computer game. 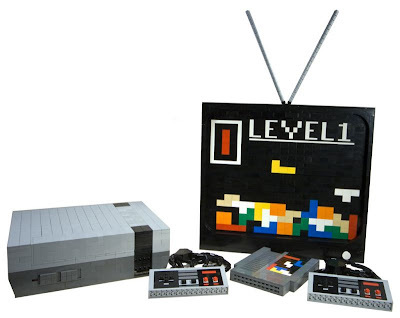 And now, it's been immortalized in brick by AFOL Dave Sterling, who put together a television displaying a Tetris game, NES controllers, game cartridge, and system with a working loading mechanism. The pixelated game was a natural for LEGO-ization and Dave nailed it. His build secured him a spot in the finals of the MOCOlympics on MOCPages.com -- a build competition that inspires some amazing creations. Between Dave and his wife Stacy -- who was recently selected a LEGO Ambassador -- there's a powerhouse AFOL couple in Wisconsin. I'm always excited to see the next build that is coming out of their basement/LEGO Lair.